Born in Tregaron, Wales, Huw Rhys-Evans won the Blue Riband Prize for the Singer of the Year at the Royal National Eisteddfod of Wales and on three occasions, the Tenor Solo Award. 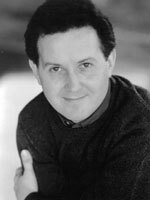 Following studies with Kenneth Bowen at the Royal Academy of Music, he was awarded the Tenor Prize at the 1990 Great Grimsby International Competition for Singers and completed his studies at the National Opera Studio. Huw Rhys-Evans is particularly celebrated as a singer of Rossini, his engagements include Carlo/Goffredo in Armida, the title role Le Comte Ory and Torvaldo from Torvaldo e Dorliska at the Rossini in Wildbad Festival, Count Almaviva from The Barber of Seville for Opera North and Spier Opera,South Africa, Pilade from Ermione, Idreno from Semiramide for Chelsea Opera Group and Belfiore from Il Viaggio a Reims at the Palace of Verseille and the Strasbourg Music Festival. Other Operatic engagements have included Harris from Uncle Remus for Pegasus Opera, Flute from A Midsummer Night's Dream and Brighella from Ariadne Auf Naxos for English Touring Opera. Vivaldo form Die Hochzeit des Camacho at the Flanders International Festival, Duca Ottavio form Don Giovanni (Gazzaniga) and Errico La Vera Costanza for Bampton Classical Opera, (for the latter, he was cited as amongst Who's Hot by OPERA NOW), Ferrando Cosi Fan Tutte for Madrid Comic Opera, Opera d'Automne and Tours Opera, Don Ottavio from Don Giovanni for Perth Festival Opera, Belmonte from Die Entfuhrung aus dem Serail for Opera Project, Nadir from The Philosopher's Stone for Collegium Musicum 90 (broadcast on BBC Radio 3), Pang from Turandot for Lyric Opera Dublin, Pong from Turandot for Mid-Wales Opera, Brighella from Ariadne Auf Naxos for the Norwegian State Opera, Young Servand from Electra at the BBC Proms, First Jew from Salome for the Bastille Opera, Third Jew from Salome for Merseille Opera, and Hyllus for Handel Hercules at the Varazdin Baroque Festival Croatia with the Welsh Baroque Orchestra. Huw Rhys-Evans made his Carnegie Hall debut in 2001 and is particularly celebrated as an interpereter of the Evangelist in the J.S. Bach Passions. His concert engagements have taken him throughout the UK as well as to France, Germany, Italy, Canada, USA, The Netherlands and Singapore. He has broadcast for BBC Radio 2's Friday Night is Music Night and his recordings include Judge in Le Calife de Bagdad, Gouvy Cantata Egill and Stabat Mater, Vivaldo in Die Hochzeit des Camacho and All Through the Night ( Welsh songs with Harp). His latest recording of 'Torvaldo e Dorliska' by Rossini has just been released on the Naxos label. Huw is singing the role of Filippo in Haydn's Opera L'infedelita Delusa with Aix-en.Provence Touring Opera Company (Touring Europe) up to March 2010.